Lichtenfels (Germany), April 4, 2017: It’s all about the head – and the face. There is nothing that we identify ourselves by more than our face. We are how we see ourselves. And what’s more: With sight, hearing, smell and taste four of our five senses are located in the head and on the face. Severe craniomaxillofacial traumas or deformities threaten not just the way our senses work. They often also have psychosocial consequences: The patients affected then not only suffer from functional disorders in that they cannot eat, taste, swallow or speak properly. They are often also shunned in their immediate environment. Craniomaxillofacial surgery is a procedure for correcting such injuries and deformities through distraction and osteosynthesis. The name Karl Leibinger Medizintechnik has been synonymous since 1979 with implants in craniomaxillofacial surgery. Karl Leibinger Medizintechnik is a company that belongs to the KLS Martin Group. Resorbable implants were added in 2000. The most recent development are patient-specific individual implants for correction through distraction and osteosynthesis in the event of traumas or deformities. Initially manufactured by conventional means, since 2013 these implants have also been manufactured additively. This is based on the LaserCUSING process from Concept Laser, whose M2 cusing machine is used at Karl Leibinger Medizintechnik. Behind this lies a simple basic approach which has the ability to transform surgery: for the individual patient rather than a standard solution. To manufacture patient-specific implants, Frank Reinauer, Head of Innovation and Production of Biomaterials at Karl Leibinger Medizintechnik, now consistently relies on additively manufactured implants. Distraction osteogenesis can be traced back to the Russian surgeon Gavril Ilizarov, who used it for the first time in the 1950s in Russia. Distraction osteogenesis involves the extension of bones. Sometimes a bone “forgets” to grow. The distraction “reminds” the bone to grow again. It is encouraged to fulfill the genetically prescribed “blueprint.” For this reason, it is usually sufficient for example in the pediatric treatment of craniosynostosis to perform a one-off operation in order to open and distract the ossifying skull so that the brain is given the space it needs to grow. The procedure also became established in the West at the end of the 1980s. Today it is impossible to imagine the clinical practice of CMF surgery without it. What is more: Distraction osteogenesis is the procedure of choice in many cases. 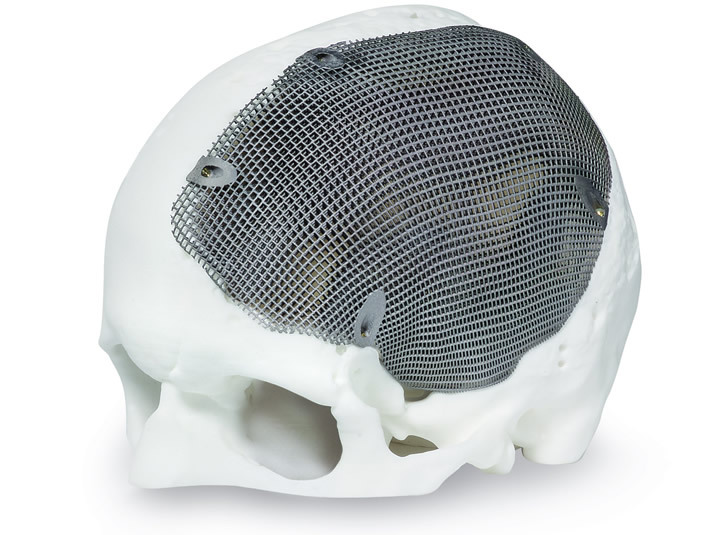 KLS Martin has come up with numerous innovative distraction systems to help to establish this technique globally in operating rooms for craniomaxillofacial surgery. There is hardly any problem that KLS Martin cannot solve with a distractor specially designed for it. Distraction is usually carried out in the midface and on the jaw. KLS Martin is one of the world’s leading suppliers of many of the essential items for operations in CMF surgery –ranging from plates, meshes, screws, pins, distractors, patient-specific implants through to lasers, HF equipment, surgical lights and sterilization containers. The second key concept is: titanium osteosynthesis. This involves giving the bone new stability. The impetus for this advanced development in the field of osteosynthesis was provided by Professor Maxime Champy: Thanks to his revolutionary observations in relation to the biomechanics of the cranium, KLS Martin is today one of the world’s leading specialists in this field. Particularly in orthognathic and reconstructive surgery, nowadays doctors must constantly face up to new challenges. A high degree of ambition and vision in combination with many years of experience is therefore absolutely crucial for developing suitable solutions. KLS Martin meets these high requirements with state-of-the-art manufacturing technologies and perfect collaboration between scientists and users. A surgeon today essentially decides between three types of craniomaxillofacial implants: plastic implants, for example made of polyether ether ketone (PEEK), deep-drawn metal sheets, titanium mesh, titanium solid and now also additively manufactured titanium implants. Due to its excellent biocompatibility and its high resistance to corrosion titanium has gained immense popularity and has successfully established itself as the material of choice in the medical field. Other than PEEK, where there is absolutely no bone ingrowth, it allows the bone to grow and is therefore the perfect material for implants in combination with lattice structures made by additive manufacturing. Depending on the indication, titanium implants are likewise developed individually and manufactured conventionally as a mesh or as a high-strength solid reconstruction version. There was the obvious thought of why manufacture by conventional means if an additive approach was also possible? Frank Reinauer: “We have of course long had our eye on the additive approach. But we also had very precise notions of what the machine needed to be capable of. After the first decade of 3D metal printing, the time seemed to have come to get involved.” However, initially there was the hurdle of investing in AM (additive manufacturing) to overcome. Frank Reinauer: “If you make a decision based purely on economics, then you shy away from the risk and tell yourself to let others try it first. But in our case – we are an owner-managed company – the management quickly recognized the future opportunities that lay in store for us. The decision to get involved was made for strategic reasons, and this was absolutely the right decision. We purchased our first AM machine from Concept Laser in 2013. “This decision, balancing the desire for innovation and the assessment of risk, proved to be a fruitful one: The complex part requirements for medical implants, even in light of very complicated rules and regulations, meant that the AM machine very quickly paid for itself. Given the pressure of time for an operating room, the amount of time saved with tool-free manufacturing should also not be underestimated. But above all the strategic decision was an important driver because an additively manufactured titanium implant for an individual patient is a giant leap forward for clinical practice. The increasing spread of these implants around the world is also reflected in the fact that they are now a significant revenue driver for the company. After we started using 3D metal printing, it very quickly became apparent that laser melting was the method of choice for titanium osteosynthesis. Now it is even possible to produce large-scale reconstructions with complex geometries. In addition, the geometric freedom can also cater for specific esthetic requirements. For the surgeon, it is not just about restoring functionality, but also always about the esthetic look. The parts have high strength, and the material is biocompatible. Even those with allergies can receive titanium extremely well. Frank Reinauer: “From numerous aspects we view titanium as providing the benchmark for implant technology.” Additive manufacturing with metal also offers the opportunity to manufacture specific partial surface roughnesses of the implant so that it can fuse with the bone very quickly at the edges of the implant. Frank Reinauer: “But there is another very important aspect in favor of additively manufactured titanium implants: the patient-specific geometry and precision fit. Ultimately this means a high level of functionality.” The surgeon can use imaging techniques such as CT (computed tomography) or MRI (magnetic resonance imaging) to cater for the specific anatomy of an individual patient. The engineers from Karl Leibinger Medizintechnik process this data to create STL data which serves as the initial data for 3D construction and manufacturing on a M2 cusing from Concept Laser. One can refer to a digital process chain at Karl Leibinger. The parts are built up on the M2 cusing very promptly,and even large-scale parts can be accommodated in a build envelope of 250 x 250 x 280 mm³ (x, y, z). Like all machine solutions from Concept Laser, for reasons of user-friendliness and safety the M2 cusing also features physical separation of the process chamber and handling area. It is robust and suitable for 3-shift operation. After the parts have been built up, the parts are heat-treated to reduce tension, and then sterilized and packaged in a Class 7 cleanroom. The use of these implants is expanding. There are currently more than 20 engineers employed worldwide on handling assignments for clinics. Karl Leibinger Medizintechnik offers surgeons a transparent order handling system. It is a web-based platform which is controlled via an APP. On the clinic site the surgeon stipulates the patient data, geometric demands and the date of the operation. In addition to the patient-specific implants, anatomical models for optimum presurgical planning can also be requested on this site. It is often also necessary to cater for special requests in the construction, for example when removing a tumor that needs to be planned on a larger scale. For complicated interventions, Karl Leibinger Medizintechnik then also offers a complete implant kit which can be installed very quickly and precisely in an operation. Before making the decision to fabricate, the doctor sees a draft design and a price quotation. This means we are able to supply additively manufactured implants for an operation within a week. The specific geometry and precision fit are crucial in the operation because they shorten the operating time, reduce the risk of the operation, and the surgeon can concentrate on the actual operation itself. The patient benefits from a safe operation and a quicker recovery. We spoke to Frank Reinauer, Head of Innovation and Production of Biomaterials at Karl Leibinger Medizintechnik GmbH & Co. KG, about the application and potential of laser-fused implants. Editor: Mr. Reinauer, would you please first explain to us what we should think of when we imagine craniomaxillofacial surgery? Frank Reinauer: In craniomaxillofacial surgery, reconstructions of the skull (cranium), the upper or lower jaw and the nose in the midface are treated by surgeons – with the exception of the dental area, for which dentists are responsible. Internally we refer to “everything above the tie.” Corrective methods are distraction and osteosynthesis. We often have to work with very complex and large-scale reconstructions which should also live up to a high esthetic standard. Editor: How are your craniomaxillofacial implants certified? Frank Reinauer: When it comes to the materials, we use materials that are already certified. A series of regulations must then be complied with in the manufacturing process. Initially this is the CE mark. In addition, the DIN Standard 13485 and finally the guidelines of the United States Food and Drug Administration. There are then also special regulations for certain countries. The versions of the Medical Devices Act and the Medical Devices Regulation (MDR) also provide a basis. In addition, there are of course also audits by authorities that we are required to undergo. You see, we constantly have to contend with a series of legal or regulatory specifications which must be meticulously complied with if you want to supply these implants. This is great know-how for us as a supplier. Editor: Given this barrage of specifications, how did you come up with the idea of manufacturing additively? Frank Reinauer: Coordinating these specifications for additive manufacturing was of course a fair feat which also took up quite a bit of time. I did in fact occasionally forbid people here internally from referring to 3D printing because when they say this people often mean 3D printers sitting on their desk. There are even doctors who think they can print out these parts in the hospital themselves. Industrial or even medical 3D manufacturing has very little in common with this. To this extent, I see additive manufacturing as a valuable extension to processes such as milling, grinding, drilling or turning. From my perspective, the traditional methods of machining have now been expanded to include additive manufacturing using the laser melting process with metals. Our products are niche products which are created with a very high level of quality, a high precision fit and working in close collaboration with surgeons and the medical staff at a hospital. All product lines were thus gradually created organically, one after the other. Our products reflect our high degree of specialization and are created through dialog between engineers and hospital staff. As we have been engaged in craniomaxillofacial surgery for a long time, rapid technology methods have always been very important to us. The LaserCUSING process or powder-bed-based laser melting of metals was particularly appealing to us: It enabled certified materials to be used to manufacture patient-specific implants in batch sizes of 1. The high reproducibility of the part structure is also important. Additive manufacturing also provides another very important aspect for medical technology: Every part can also provide documentation in its digital creation. This is a very big plus point when it comes to production reliability for us. Editor: What particular requirements are placed on patient-specific implants? Frank Reinauer: Depending on the patient’s trauma or deformity, there is a demand for complex and/or large-scale implants which should also have esthetic appeal. This is why very precise adaptation of the implant to the healthy bone structure is required, also in interaction with transplants of healthy tissue or bone. Editor: How are these patient-specific implants produced? Frank Reinauer: We use a machine from Concept Laser, for example. The implants are additively manufactured on this machine. The surgeon may of course also decide to opt for a solution in PEEK or for deep-drawn sheets from us. A laser-melted solution, let’s say made of titanium, offers him the advantage of a biocompatible material which is also suitable for allergy sufferers. In addition, titanium has very high strength. Particularly with laser melting, we can tailor the construction very specifically to the patient’s anatomical structure, that is to say the optimum geometry, and incorporate the biological structure at the same time. We can define specific, including partial, surface roughnesses which help to ensure that the implant grows in well. Titanium, originally a material from the aerospace sector, has developed into a benchmark for medical technology. The material has set the standards in titanium osteosynthesis. Editor: How exactly do surgeons collaborate with you? Frank Reinauer: Essentially today the surgeon is part of a process chain that is internet-based. Without being aware of it, the surgeon is part of the Industry 4.0 strategy with an additive solution. Before an operation, the surgeon initially assesses which geometry would be the right choice for an implant. He also decides on a particular material, so biocompatible titanium or stainless steel, as well as a solution in plastic, e.g. PEEK, possibly even a deep-drawn part. So now let’s take an additively manufactured titanium part as an example. More than 20 engineers work for us in construction around the world. With additive manufacturing we can fully cater for what the surgeon wants. The surgeon provides us with data from imaging techniques such as MRI or a CT done by a radiologist from which, scheduled to meet a stipulated operation date, we generate and construct the STL data as the starting point for the actual additive manufacturing. The engineers must then achieve the balancing act of matching on the one hand the requirements of the surgeon or simply the patient’s circumstances with a construction that suits the process. There is a dialog with the surgeon with possible re-engineering – although time is often very tight because the patient is waiting for their operation. Editor: How exactly is such an order processed? Frank Reinauer: Engineers are not doctors and doctors are not engineers. But both worlds must talk to one another. We offer a transparent order handling system to enable this to happen. It is a web-based platform which can also be controlled via an APP in which we and the hospital side are in dialog and can see what and when something is happening. In addition to the patient-specific implants, anatomical models for optimum presurgical planning can also be requested on this site. It is often also necessary to cater for special requests in the construction, for example when removing a tumor that needs to be planned on a larger scale. We then also offer a complete implant kit which can be installed very quickly and precisely in an operation. Before making the decision to fabricate, the doctor sees a draft design and a price quotation. This means we are able to supply additively manufactured implants for an operation within a week. A patient-specific implant is a great gift, but it also requires a finely tuned process chain between the engineer and doctor through to the operation. Editor: How do the surgeons portray their experiences? Frank Reinauer: These products are specifically tailored to a patient. Surgeons and patients very much appreciate this. But ultimately these implants also offer a guarantee of quality in the operation. The operation can proceed more quickly thanks to the implant set. The part is manufactured very precisely, and the healing process runs faster and better overall. The reactions and comments from the surgeons that work with us are generally extremely positive, sometimes almost euphoric even. Editor: What specific comments are these? Frank Reinauer: We receive comments and accounts from operations in practice by a variety of different channels. Our additive implants and the ease of order processing receive a great response at specialist medical congresses. The surgeon is the best advertisement for us. The general thrust of opinion is that daily life in the operating room is now safer, the operation can proceed without any complications because the implants fit very precisely and the patient can recover faster. Surgeons often report that the implant can be inserted very securely and they can very much concentrate on the actual operation. This means a less stressful situation for the surgeon and of course for the patient too. In addition, the operating time is reduced considerably, which given the costs of €24 – 240 per minute, depending on the specific application, also means an enormous cost saving. Editor: How many implants do you produce using additive technology? Frank Reinauer: That is hard to say because there are several thousand that we deliver around the world. But the demand is growing strongly because word is getting around the experts that almost any operation can now be planned and carried out very well. Today we generate a significant proportion of sales from implants, with an enormous range of manufacturing. It appears that a further strong spread of our approach can be expected. Editor: How did you end up choosing Concept Laser as the plant and machine manufacturer? Frank Reinauer: Our motives were at very different levels. We embarked on the process of choosing a partner with a completely open mind and chose Concept Laser as the supplier. The M2 cusing machine from Concept Laser offers us a large build envelope and therefore numerous options that allow us to deliver complex and large-scale implants. As we process a great deal of titanium powder, Concept Laser’s safety concept with physical separation of the process chamber and handling chamber was a crucial factor for us, and also helps to make the machine more convenient to use. When it comes to processing reactive materials, Concept Laser has undoubtedly set the benchmark for safety and with a contamination-free concept. Yet it was not just the technology and the safety but the overall package that won us over. Our two companies are essentially “makers.” To this extent, Concept Laser was a very good fit for our corporate philosophy: perfect solutions, value-based, cooperation based on partnership, great reliability of statements and strong soft factors that enable a long-term working relationship. Editor: What were your negative and positive experiences with the new additive manufacturing? Frank Reinauer: The time factor is often one of the difficult experiences. After all, we want to offer an optimum solution but often the time until the operation is very tight, and then one asks oneself the question: With all the engineering and re-engineering, have I also done everything to ensure that the operation proceeds smoothly for the surgeon and the patient? This does of course always occupy the employees and me with such a sensitive product. But the comments from the surgeons after an operation are particularly positive. Then I am certain that we have done things right. It is a very delightful feeling to know that we have really been able to help a patient with our additive implants. Editor: Thank you for the interview. The medium-sized KLS Martin corporate group, which is based in Tuttlingen, develops comprehensive solutions to medical problems. They are produced in close collaboration with surgeons and specialist medical staff and help to restore the health of patients. Back in 1923 there was inflation in Germany and money with stable value could only be earned abroad. But a certain size of company was needed for export. To achieve this size, seven competitors from Tuttlingen joined forces. This was the formation of the sales company Gebrüder Martin, to which Karl Leibinger Medizintechnik GmbH & Co. KG belongs. KLS Martin generates around 75 per cent of its sales in foreign markets, with around two-thirds in Europe. The group is represented by its own subsidiaries and partner companies in the USA, Russia, China, Japan, Dubai/UAE, Brazil, Malaysia, Australia, Italy, France and the Netherlands. Trade partners in more than 140 countries around the world are supplied with products from the product supply center in Tuttlingen. The logistics center in figures: 50,000 storage locations, over 2,000 order items per day, 95 per cent supply capability. KLS Martin sees itself as a partner to surgeons, operating staff and the central sterile services department with its extensive, application-oriented product range. The range contains more than 16,000 instruments and devices as well as comprehensive services. The name KLS Martin is a guarantee of high-quality and innovative medical technology. KLS Martin is particularly strong in the fields of OMS/CMF surgery, hand surgery and electrosurgery as well as for operating lights which are largely covered by Karl Leibinger Medizintechnik GmbH & Co. KG. At KLS Martin all processes from product development through to after-sales service are regulated by a comprehensive quality management system. It conforms to the international standards DIN EN ISO 13485, DIN EN ISO 9001 and European medical devices legislation (MDL). National guidelines such as those of the United States Food and Drug Administration (FDA) or Canadian legislation are fully integrated. The majority of the materials and products are tested in the in-house laboratory, simulating the most extreme conditions. The patented LaserCUSING® process from Concept Laser is used to create high-precision mechanically and thermally resilient metallic components. The term “LaserCUSING®,” coined from the C in Concept Laser and the word FUSING, describes the technology: The fusing process generates components layer-by-layer using 3D-CAD data. In this process, fine metal powder is fused locally by a high-energy fiber laser. The material solidifies after cooling. The contour of the component is created by redirecting the laser beam using a mirror redirection unit (scanner). The component is built up layer by layer (with a layer thickness of 15 – 500 μm) by lowering the bottom of the build chamber, applying more powder and then fusing again. What makes systems from Concept Laser unique is stochastic navigation of the slice segments (also referred to as “islands”) which are processed successively. This patented process ensures a significant reduction in stress when manufacturing very large components. Concept Laser GmbH from Lichtenfels, Germany is today, unlike almost any other company, one of the real pioneers and key drivers of powder-bed-based laser fusing with metals. The technology driver here is the patented LaserCUSING® process, also referred to as 3D metal printing, which over the course of 15 years has evolved the additive manufacturing of 3D components from a rapid technology to the stage of industrial series production. When Frank Herzog founded Concept Laser GmbH back in 2000 in Lichtenfels, a metal laser fusing machine was an entirely unknown quantity in the market. How is a 3D geometry created from metal powder using a laser? What does 3D printing or a digital process chain mean for the manufacturing of the future? The answer was industrial machine technology: Concept Laser unveiled the first machine of this type in 2001 at Euromold in Frankfurt. With 65 patents granted today and over 120 patent applications, Frank Herzog and his workforce of around 190 employees continue to champion and develop the LaserCUSING® process. The company caters for the global market for laser fusing machines across all different sectors from sites in Germany, the USA and China and through a network of more than 35 distribution and service partners. Concept Laser’s high quality standards, expertise in processes, applications and materials deliver reliable and cost-effective solutions which prove their effectiveness in everyday production and are primarily aimed at reducing part costs. In addition to commercial aspects, the process offers a large number of other benefits compared to conventional methods of production: The components are lighter, the designer has new freedoms, the topology and geometry are optimized, additional functions can be integrated, and less raw material is required. What this means is components that were previously manufactured using machining processes are now being redesigned to fully exploit the new potential offered by additive manufacturing. Concept Laser offers a range of small machines (50 x 50 x 80 mm3) right through to the machine with the world’s largest build envelope (800 x 400 x 500 mm3). Machines from Concept Laser that are equipped with multilaser technology are among the fastest, safest and highest-quality laser fusing machines in the world. Around 650 installed machines and prestigious references and projects of this Franconian “hidden champion” around the globe send out a clear message and symbolize an outstanding technology for the future sealed with the endorsement “Made in Germany”. This entry was posted in Medical, News and tagged 3D Metal Printing, Additive Manufacturing, additively manufactured implants, additively manufactured titanium implants, biocompatibility, CE mark, computed tomography, Concept Laser, craniomaxillofacial implants, craniomaxillofacial surgery, CT, deep-drawn metal sheets, DIN Standard 13485, Distraction osteogenesis, everything above the tie, Frank Reinauer, Gavril Ilizarov, Karl Leibinger Medizintechnik, KLS Martin, laser melting, M2 cusing machine, magnetic resonance imaging, Medical Devices Act, Medical Devices Regulation, MRI, orthognathic and reconstructive surgery, patient-specific geometry, plastic implants, polyether ether ketone, precision fit, Professor Maxime Champy, resistance to corrosion, STL data, titanium mesh, titanium osteosynthesis, titanium solid, United States Food and Drug Administration by AM. Bookmark the permalink.